Yoram Zvik recently published an interesting article presenting evidence for myrmecophily in Birulatus israelensis Lourenço, 2002 (Buthidae) from Israel. The author observed this scorpion exclusively on active foraging trails of the ant species Messor ebeninus Santschi, 1927 or around their nests. Birulatus israelensis seemed also to be disregarded by the ants, while other scorpion species were attacked. This is the first observation of myrmecophily in scorpions. The authors discuss the potential benefits from this relationship for the scorpions. 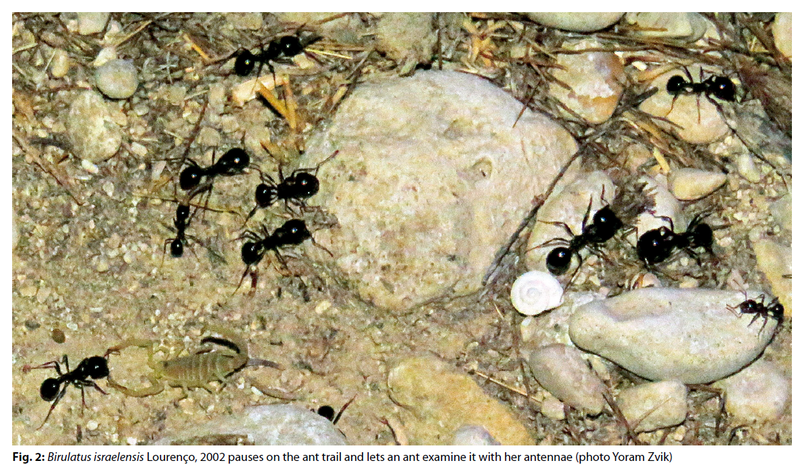 Further research is needed to understand this unusual relationship between a scorpion species and an ant species. The buthid scorpion genus Birulatus Vachon, 1974 includes three species, endemic to the Levant, each from a different location in Jordan, Israel and Syria, and all described from a single specimen. Fewer than ten specimens of the genus were collected so far. Nothing is known regarding their biology and ecology. During three collecting expeditions in the summer of 2016 near Mehola in the Jordan Valley, Palestine, 31 individuals of Birulatus israelensis Lourenço, 2002 (Scorpiones: Buthidae) were collected, all found exclusively on active foraging trails of the ant species Messor ebeninus Santschi, 1927, around their nests or coming in and out of the nests. These findings suggest that Birulatus has a myrmecophilous relationship with M. ebeninus ants. Thanks to Alexander Ullrich for sending me this article!